George Robertson (Lord Robertson) is Deputy Chairman of TNK-BP, the Russian oil and gas company jointly owned by BP and Slavneft. He is also Chairman of Cable & Wireless International. He was Secretary General of NATO from 1999-2003 and Defence Secretary of the United Kingdom from 1997-1999. In 1978 he was elected to parliament for the Hamilton constituency in Lanarkshire. He was Parliamentary Private Secretary to the Social Services Secretary in 1979 and from 1979-1993 he held senior opposition roles including 11 years on Foreign Affairs and in particular Europe. In 1993 he was elected to the Shadow Cabinet and served as Principal opposition spokesman on Scottish Affairs. After the 1997 General Election he was appointed Defence Secretary by Prime Minister Blair and was responsible for carrying through the Strategic Defence Review and for leading the military campaign in Iraq in 1998 and Kosovo in 1999. 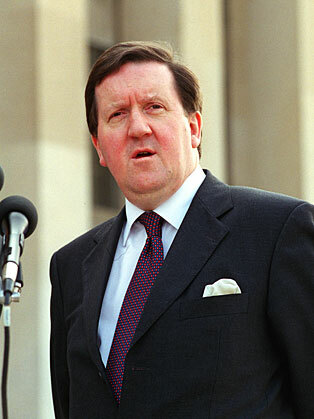 In October 1999 he was appointed 10th Secretary General of NATO and elevated to the House of Lords. His time at NATO coincided with the 11 September attacks on the US, the first invoking of Article 5 of the North Atlantic Treaty, the crisis in Macedonia, the creation of the NATO/Russian Council and NATO’s assumption of the stablisation role in Afghanistan. He chaired the NATO Summit in Prague in 2002, which invited seven new countries into the Alliance. George Robertson is a Non Executive Director of the Weir Group plc and the Smiths Group plc, a Strategic Advisor to the Royal Bank of Canada Europe, and on the Advisory Board of Englefield Capital and is Senior Counsel to the Cohen Group (USA). He is joint President of the Royal Institute of Institutional Affairs.